Swan Hill is affectionately known as the heart of the Murray. Like other iconic Victorian towns such as Mildura, Echuca and Wodonga, Swan Hill graces the banks of the Murray River which divides Victoria and New South Wales. Wot better place to straddle one foot in each state? 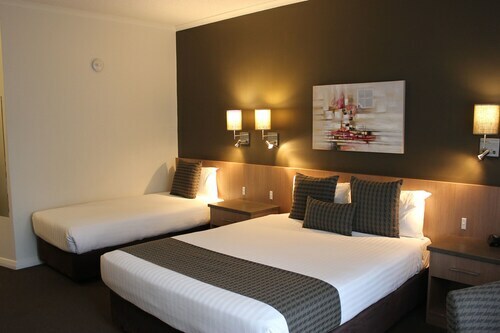 Book your Swan Hill accommodation with us today! Lying 336km north-west of Melbourne, Swan Hill is a historic town. Discovered by European explorer Major Thomas Mitchell in 1836, the town originally served as a passage town with the only punt crossing within 100km. It wasn’t until Francis Cadell discovered Swan Hill in 1853 – while navigating the Murray River in a paddle steamer from its mouth in South Australia – that the town became a major inland river trading port. Soon after, a pioneer settlement was established in 1963. As railways superseded the river trade, agriculture emerged as the region’s prospering point. Today, citrus farms and vineyards still surround the town. Despite its position in Victoria’s ‘food bowl’ region, the Murray River is still a major drawing point for visitors. River cruises, historic paddle steamer voyages, and houseboat holidays are popular pastimes on these Murray waters. Boating and fishing opportunities also abound, with talk of catching fresh Murray Cod rife amongst keen fishermen. But if the fish aren’t biting, you can do the honours. Local restaurants dish up fresh cod and yabbies, as well as avocado, citrus and stone fruits fresh from the picking. If you prefer your grapes in liquid form, award-winning wineries are just a stone’s throw away. One of the most popular local attractions for adults and children alike is the Pioneer Settlement. Recreating the atmosphere of a late 19th-century pioneer river port town, it’s home to over 50 original and recreated buildings. Explore the church, a working blacksmith’s shop and a working print shop from pioneering days. There are over 60,000 historical objects throughout the settlement to blur the lines between history and reality. Around town, the journey continues. Seek out the historical clock tower opposite the post office, and the 1935 town hall building. Fast forward to now and the Swan Hill Regional Art Gallery is highly regarded as having one of the country’s most complete collections of naïve art. There are also six beautiful golf courses in the area, a number of parks and picnic areas, and bushwalking tracks to traverse in the Vinifera and Nyah State Forests. Lake Boga is also a lovely outing from Swan Hill, just 16km away. Full of camping spots and swimming areas, the natural lake town is home to the Flying Boat Museum, and the site of the RAAF repair depot used in World War II. Getting to Swan Hill is easy by car with a network of major highways intersecting here. The Murray Valley Highway, the Calder Highway and the Sunraysia Highway all pass through Swan Hill. Alternatively, buses and trains run daily routes into town. Once you’re here, getting around is possible on foot, but a car (which can be hired locally) is the best way to really explore the region afar. Home to a piece of rich Australian pioneering history, with the peaceful Murray River pumping life into its agricultural heart, Swan Hill is a very special destination to unravel. 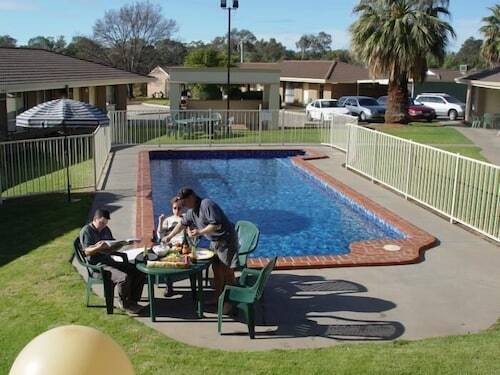 Check out our range of Swan Hill hotels today! How Much is a Hotel Room in Swan Hill? Hotels in Swan Hill start at AU$95 per night. Prices and availability subject to change. Additional terms may apply. It was everything we needed & expected it to be and more. It was very central to all amenities in the heart of Swan Hill. Shops,eateries, business facilities and health services. Very clean, comfortable and well run accomodation. We would stay here again & highly recommend this property.